Cubic zirconia (zirconium oxide) melts at 2750 C, and there are no commercial materials that can handle the melt. The hot zirconium oxide would melt any container that tried to hold it. A "skull crucible" was designed to hold the starting material. The zirconia can be stabilized by a small percentage of CaO or YO (yttrium oxide). The mixture is placed into the skull crucible. 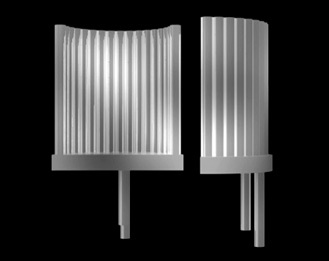 The crucible is made up of a continuous series of metal pipes that be cooled by a flow of liquid through them. 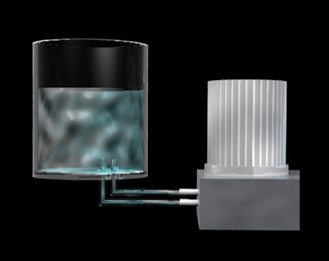 The liquid keeps the outside layer of molten material cool enough not to melt. It forms a very thin skin which holds the liquid zirconia mixture in the melted state. 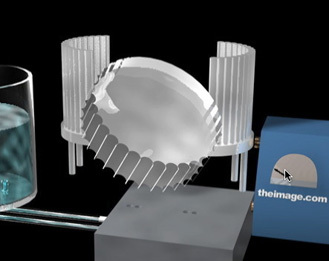 The thin fingers on the outside of the crucible allow tiny gaps which let the rf (radio frequency) waves pass through and reach the oxide. The mixture is made up of zirconium oxide, a stabilizer (yttrium or calcium oxide) and a small amount of zirconium metal. 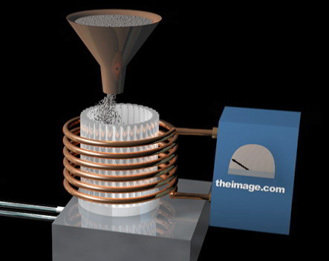 A copper coil is wrapped around the crucible and acts as an antenna delivering the required energy. About 4 MHz at 100 KW of power. The zirconium metal acts a transducer and is initially heated by the rf (radio frequency) energy. Without the metal the zirconia mixture will not heat, as the zirconium oxide is an insulator at room temperature. Power is applied to the coil and coolant is pumped through the skull crucible. Eventually the melting point is reached and the interior becomes a solution. The starting zirconium metal reacts with oxygen in the air and is converted to more of the oxide. 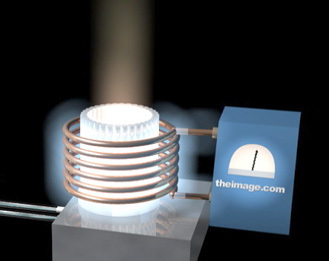 As the temperature goes up the zirconium oxide also becomes an electrical conductor and heats more rapidly. Unlike the final diagram, the crystallization actually causes shrinkage and the material comes out in many pieces with gaps between. It does not form a single crystal. The crystals are annealed for a few hours to remove any additional strain. makingcz2.mp4 If you would like to see the process animated you may see it here. It is in Quicktime format (mp4 compressor) and is about 10.1 MB in size. Use the back arrow key to return to this page after playing.